The multi-media edition is dedicated to the 100th anniversary of Kasym Tynystanov. Kasym Tynystanov is an outstanding scientist, linguist - Turkologist, poet, specialist in folklore, in Manas studies, playwright, journalist, translator, enlightener of the Kyrgyz people, prominent public and state figure. He is the creator of Cyrillic symbols of the Kyrgyz language. The CD presents his written legacy, documents, photo- pictures of his manuscripts and archive photo- materials about Kyrgyz people from pre- revolutionary times till our days. The CD also presents video fragment and melpdies of Kyrgyz people. 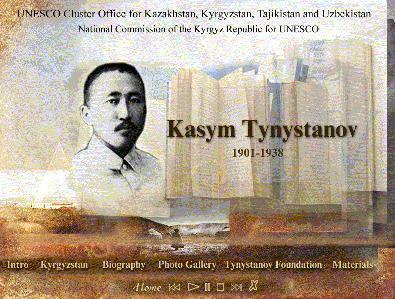 The CD-ROM was issued by K. Tynystanov Foundation with support of National Comission of the Kyrgyz Republic for UNESCO under the UNESCO HeritageNet Programme in close cooperation with Information Society Division, UNESCO Cluster Office for Kazakhstan, Kyrgyzstan, Tajikistan and Uzbekistan. Artistic design of the project is made by Omurkul Borubayev. Technical elaboration of the project is made by Anton Shapovalov.